Whether you're looking for your first Bouncy Castle Insurance policy or seeking a better price on your current Inflatable Insurance, let Peacock Insurance find you a great deal. 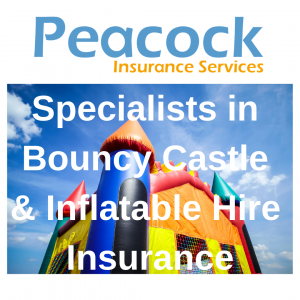 Why choose Peacock for your Bouncy Castle Insurance? Owners of inflatable play equipment including bouncy castles, rodeo bulls, ball ponds and soft play equipment – Cover provided for – public liability, employers liability and loss or damage to equipment. We have access to specialist Inflatable Insurance schemes for any hirer or operator of inflatable play equipment. For a competitive no-obligation quote, or for further information, talk to our team of experienced staff today on 02476 437 600, or alternatively request a quote online by clicking Get A Quote. We also arrange cover for events such as fetes, charity days or parties, please click Event Insurance and request a quote to found out more. We welcome all enquires from manufactures of inflatable equipment, We can arrange bespoke packages to meet your clients needs which may also help increase your sales. Contact salesonline@peacockinsurance.co.uk for more information. If you can bounce on it and your apparatus is not listed above, don’t worry get a quote today by calling 02476 437 600, or alternatively click Bouncy Castle Insurance to start a quote online. DID YOU KNOW? We can sometimes save you up to 25% by tailoring your Bouncy Castle insurance cover specific to your needs! These schemes extend to many diverse attractions within the event arena such as stalls, amusements and fairground type rides. Whatever your insurance needs, from public liability to goods in transit and material damages (theft, accidental / malicious damage etc. ), we can find a competitive policy to suit your requirements and your pocket. Not only can we at Peacock arrange insurance for all the above and similar equipment, we can insure all other forms of event entertainment including stalls, mechanical rides etc. such as:- Hot Dog Stands, Laser Quest / Quasar, Paintball, Waltzers, Rifle Ranges etc. For both adults and children, supervised or unsupervised, a favourite at any event. Big, foam filled suits making the participants look like huge Japanese wrestlers, the idea being to wrestle or throw the opponent out of the padded arena or onto their back, usually followed by a ‘splat’! Inflatable assault courses where participants climb air filled walls, squeeze through gaps, climb cargo nets etc. A giant spinning wheel where bets are taken on when the participant will fall off and from which numbered / coloured segment. Participants attach themselves to a long piece of elastic and run along an inflatable track until they are sprung backwards. A massive event favourite where participants run, jump and stick to a huge inflatable Velcro wall. Mechanical bucking bronco, or reindeer, or sheep! Participants hold on tight for as long as they can until they are flung off onto a safe inflatable floor. If you need to talk to one of our experts directly please Call 02476 437 600 or click above to obtain an online quote.